Heart of the Story: Barnabas was a New Testament Christian who integrated Paul into the new Christian church. Back Story. Barnabas’s given name was Joseph; however, in the new Christian church he was named Barnabas. Barnabas means Son of Encouragement. The name was given to Joseph because it described his character. Barnabas was from the island of Cypress. Barnabas was an early church leader whose behavior is documented primarily by Luke in the book of Acts. Story Line: The first time Barnabas is named is in Acts. He owned a field which he sold and gave the money to the Jerusalem church. The money was distributed to the needy in the new Church (Acts 4:32-37). We see how Barnabas was both wise, influential, and brave. After Paul’s conversion, Paul attempted to join the disciples in Jerusalem (Acts 9:26-28). They rejected him because the church leaders didn’t believe Paul was a true convert. These leaders thought that Paul’s actions were a ploy to gain access to their fellowship in order to learn who was their leaders. Then, Paul would have the leaders murdered. 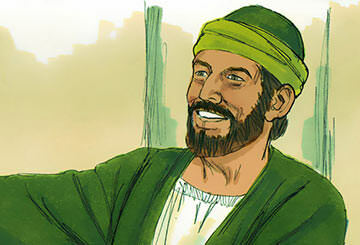 Barnabas met with Paul and heard the story of Paul’s conversion directly from Paul. Barnabas took Paul to the apostles and told the apostles how Paul was converted by Christ himself. Further, Barnabas told the disciples how Paul preached the new faith fearlessly in Damascus to the point where Jewish leaders in that city tried to kill him. Through Barnabas’s introduction and support, Paul was accepted by the apostles who headed the early Christian church in Jerusalem. Paul began debating and preaching the good news of Christ in Jerusalem. Eventually, Paul had to leave Jerusalem because the Jerusalem Jewish leaders attempted to kill him. Paul returned to his home town of Tarsus in Turkey. Paul remained in Tarsus about 10 years. Then, Barnabas acted again to draw Paul into the mainstream of the early Christian church. Barnabas was preaching and shepherding Christians at Antioch where a large number of men and women were brought to the Christian faith. Barnabas needed help with this church so he made a personal trip to Tarsus and asked Paul to come to Antioch to assist him. For 1 year Barnabas and Paul were the leaders of the Antioch church. It was from Antioch that Barnabas and Paul began their first missionary journey. Pondering Relationships: The Bible described Barnabas as a “good man, full of the Holy Spirit and faith.” He was an encourager of others and in his own way a risk taker. Barnabas wasn’t afraid to meet the newly converted Paul or to take as an assistant a man that had the potential to eclipse him. Barnabas was loyal. At a later point in Acts we read that Barnabas and Paul agreed to go their separate ways because Barnabas wanted to take a young relative, John Mark, on another missionary journey; however, Paul disagreed. Paul was too impatient to nurture John Mark to maturity; however, Barnabas brought the Christian calling out of John Mark as he did with Paul. We know from Paul’s later letters that he came to appreciate the contributions of John Mark (Colossians 4:10). Reflection: Being an “encourager” is important to me. I would like this designation in my obituary. What about you? Are you an encourager? Are you willing to take the time to be a encourager in your family, church, and community. This entry was posted in Priests and tagged Barnabas, Bible Study, Carolyn Roth Ministry, Christian church, Encourager, Lesser Known Bible Characters, New Testament, Obscure Characters, St. Paul. Bookmark the permalink.